…You get the idea. The safest way to do it is to use basic food coloring — either the juices from colorful foods that are safe for dogs to eat or organic food coloring that contains all-natural ingredients. Following are some helpful tips for dying your dog’s fur… without hurting your dog or making him uncomfortable in the process. Remember, the pH level of your dog’s skin is very different than a human’s. 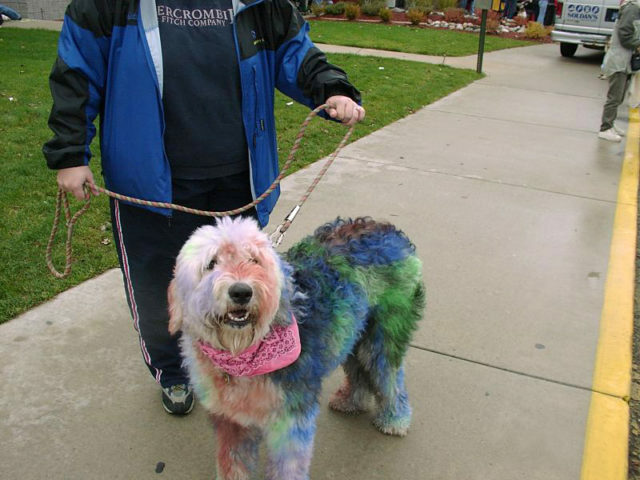 That’s why you cannot use regular hair dye to color your dog’s fur. Therefore, first and foremost, don’t use any products with harmful chemicals in them to dye your dog’s fur. The chemicals — including bleach — will irritate your dog’s skin and you’ll have to undergo a series of vet visits to get your dog’s skin and coat back to normal. Don’t make your dog suffer through this. The safest option is to use food coloring. This will not harm your dog if he should happen to lick his paws or his coat while it’s drying. The juice from any of the above should tint your dog’s fur enough to be noticeable. You can use fresh or frozen. Either squeeze fresh or thawed varieties and use a potato masher to get the most juice. Or toss into a blender or food processor. Combine 2 or more to create a whole new color. (Remember: yellow+red=orange and blue+yellow=green and red+blue=purple.) Psst… you’ll find some helpful tips in these 8 ways to make organic food coloring. #2 – If you can’t find any dog-safe foods to create the perfect color, then look for all-natural or organic food coloring — like India Tree Natural Decorating Colors. They are made from highly concentrated vegetable colorants. Best of all, they contain no synthetic dyes and no corn syrup. #3 – Alternatively, you could use regular artificial food coloring. Just be sure to use a little at a time, until you’re clear how dark the resulting color on your dog’s fur will be. #4 – Lastly, there are a few dog-safe hair dyes on the market. However, you’ll want to check the ingredients and precautions closely because most of them do contain chemicals that could irritate your dog’s skin — especially if your dog already has allergies or skin issues. Use with caution. 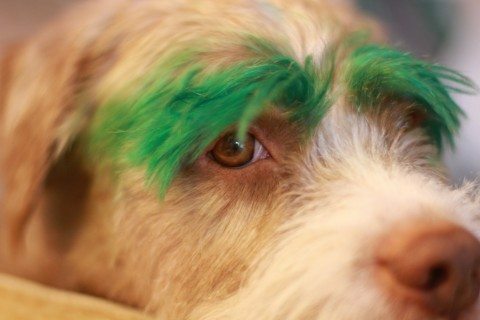 #5 – As for using the Koolaid hair color method on your dog… it’s not highly recommended. Even if you use sugar-free Koolaid, you’ll end up with a sticky mess that will probably make your dog uncomfortable. In addition, the ingredients aren’t good for your dog if he should happen to lick his skin or fur. And the ingredients in Kool-aid are not good for your dog’s skin either. For the best outcome, start with a clean dog that has been bathed and brushed. Light-colored dog fur works best for coloring. The darker your dog’s fur is, the harder it is to find a color that will tint it. If your dog is unhealthy in any way (either temporarily or ongoing), do not dye your dog’s hair. Be careful not to get any of the dye into your dog’s eyes — even natural food coloring. It’s best to dye your dog outdoors where nothing could become damaged (or spotted) when your dog shakes his fur. Be sure to wear thick rubber gloves so your hands won’t become stained. If you use a towel to pat dry your dog, keep in mind that towel will become permanently stained. Depending on how dark you tint your dog’s fur, it usually takes 4 to 6 weeks before it completely washes out and your dog’s fur is back to its normal color. Pictures Of Dog Fur Colors… For Inspiration! Enjoy the following links to photos of DIY dog hair dye experiments — some gone wrong; some are oh so right. 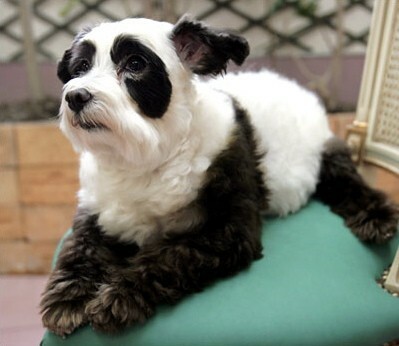 Have you seen the dog that was dyed to look like a Panda? Here’s the story behind the Panda dog. Here are more photos of tiger dogs and panda dogs.